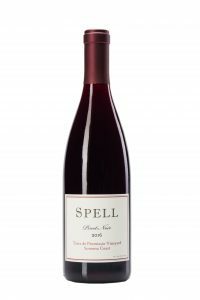 The Spell Rosé is produced from the Saignée (French for “bleed”) of the Pinot Noir. The juice for this wine is removed (“bled”) from each lot of Pinot Noir as it is being destemmed into the fermenter. It is transferred to a stainless steel tank which is maintained at 50 degrees F, to promote a slow, cool fermentation that preserves the fantastic aromatics. Once the primary fermentation has completed (2-4 weeks after the last lot of Pinot Noir is processed) the wine is moved to a selection of neutral French oak and stainless steel barrels for another 6 weeks of aging before bottling in February. 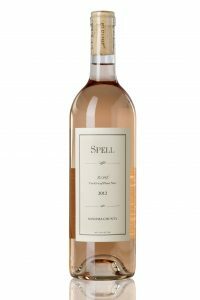 A rich pink color introduces aromas of white strawberry, watermelon rind, and peach pit are accompanied by smoky, minerality elements. Refreshing flavors of fresh spring strawberries, honeydew melon, and raspberries spread across the tongue and lead into a smooth, lingering finish. Those of you who are familiar with previous vintages won’t be disappointed. Serve chilled and drink now or over the next eight months. 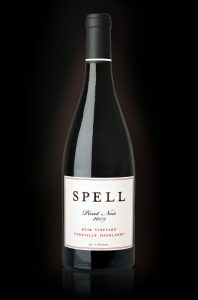 We are proud to introduce the second vintage of the Spell Cabernet. As with all the Spell wines, this wine is defined by its balance, true varietal character and unique vineyard terroir. 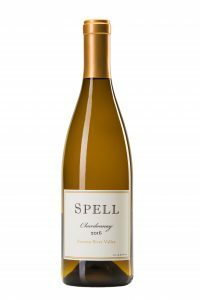 It exemplifies Napa Valley in its most noble and purest expression. From a vineyard further down the valley than the 2015, this wine possesses more concentration of fruit. Aromas of cassis, blackberry, violets, baking spice, mocha, tobacco and sweet oak fill the glass. Flavors of blackberry, boysenberry, cocoa nib, and dried herbs are balanced by smooth valley tannins. Extremely pleasing now, the structure and acidity will allow this wine to age gracefully for a decade or more. Located between the towns of Graton and Forestville in Sonoma County, the Falcon Crest Vineyard was planted in 2002 to a heritage selection of Chardonnay from the famed Montrachet vineyard in France. With its proximity to the Pacific Ocean, the growing season of warm, sunny days followed by cool, foggy evenings allows for a slow and even ripening. The extremely small clusters and berries grown at this vineyard produce wines of remarkable flavor, texture, and age ability. A hazy light chartreuse color introduces aromas of ripe apples and stone fruits, orange oil, and reductive crushed rocks. 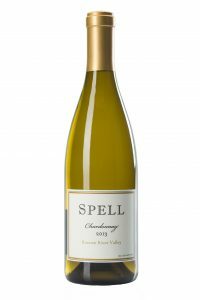 A creamy blend of lemon curd, green apple, ripe pear, stone fruit and toasted oats sweep across the palate. Extremely soft and seductive, the finish is heightened by bright acidity and savory minerality. Enjoy now over the next 2 – 5 years. The 2017 Nichole’s Blend Pinot Noir is another great wine in the history of our Nichole’s Blend Pinot Noirs made with fruit from Sonoma County vineyards including Sangiacomo and Desmond Vineyard as well as declassified barrels of our Vineyard Designated wines. From as far south as the Petaluma Gap, where the cold maritime breezes help to produce wines of excellent purity and elegance; to the east on top of Sonoma Mountain, with its volcanic soils which produce wines with structure and savoriness; to the far western edge of the Russian River Valley, which produces wines with richness and ripe dark fruit flavors. The resulting wine is an excellent example of the harmony between these distinctive regions within Sonoma County. The wine possesses an attractive inky purple hue. In the bowl, aromas of ripe raspberry, Marion Berry, Santa Rosa Plum, sassafras, cedar, and sweet oak coalesce. Concentrated flavors that mimic the aromatics intermingle with the silky tannins, sappy blue fruit, and a hint of citrus pith on the back end. Lasting flavors of ripe blackberry and espresso highlight the finish. Drink now, or over the next 7 to 10 years. The fruit for the 2016 Nichole’s Blend Pinot Noir comes from the Sangiacomo and Desmond Vineyards as well as declassified barrels of our Vineyard Designated wines. The resulting wine is an excellent example of the harmony between these distinctive regions within Sonoma County. From as far south as the Petaluma Gap, where the cold maritime breezes help to produce wines of excellent purity and elegance; to the East on top of Sonoma Mountain, with its volcanic soils which produces wines with structure and savoriness; to the far western edge of the Russian River Valley, which produces wines with richness and ripe dark fruit flavors. A deep inky blue-red color introduces this gorgeous wine. After a light swirl a mélange of ripe raspberry, Marion berry, streusel, sassafras, cedar, tobacco, and fresh cracked black pepper fill the bowl. The potpourri of aromas is matched on the palate. Decorated with suave tannins and bright acidy sappy red fruit and sassafras are tied together with goji berry and notes of blood orange. Lingering flavors of ripe raspberry and mocha bring closure to an extremely pleasing wine. Drink now, or over the next 5 to 7 years. The Umino Vineyard is owned and farmed by Dave Umino, a fifth generation Japanese American from a Central Valley farming family. In 1995, after a career as a forensic metallurgist, Dave Umino planted this vineyard southwest of Sebastopol at the top of Blucher Valley in what is unofficially referred to as the Sebastopol Hills of the Russian River Valley AVA. Planted to Pinot Noir Dijon clones 777, 667, 115 and 459 this vineyard replaced and old apple orchard. Cold maritime air funnels through the hills to moderate ripening of the fruit which produces wines of exceptional depth, concentration and character. The big boy in the lineup. An inky purple color introduces this impressive wine. Intense aromas of roasted grains, ripe summer blackberries, vanilla crème, and violets fill the bowl. Dense flavors of ripe cherries and blackberries are highlighted by hints of roasted coffee and chocolate. The finish possesses youthful, silky tannins that dance gracefully with the blue fruit and umami flavors. 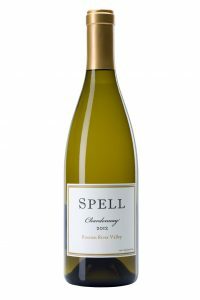 The most pleasing of the Vineyard Designates now, but like all of the Spell single vineyard wines; designed to age. A vigorous decant is recommended if you decide to pull the cork in the next 6 to 12 months. Drink over the next 10+ years. This distinct wine is introduced by inky blue-red hues. Stimulating aromas of dusty sandalwood, cola, blackberries, chamomile, dried apricots, and rose hips stir the senses. Concentrated flavors of ripe cherries, chocolate covered raspberries, Santa Rosa plum and juniper, swim across the tongue. A rich, lingering finish is defined by flavors of black tea, ripe wild blackberries, and Bing cherries. Destined to age exceptionally well. If inspired to try it now, a vigorous decant is recommended. Drink over the next 5 to 10+ years. exceptionally well. Drink now or over the next decade. 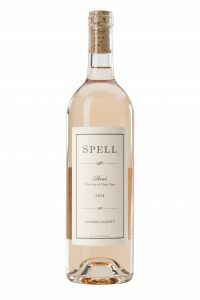 The Spell Rosé is produced from the Saignée (French for “bleed”) of the Pinot Noir. The juice for this wine is removed (“bled”) from each lot of Pinot Noir as it is being destemmed into the fermenter. It is transferred to a stainless steel tank which is maintained at 50 degrees F to promote a slow, cool fermentation that preserves the fantastic aromatics. Once the primary fermentation has completed (2-4 weeks after the last lot of Pinot Noir is process) the wine is moved to a selection of neutral French oak and stainless steel barrels for another 6 weeks of aging before bottling in January. 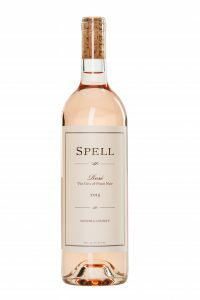 The 2015 Spell Rosé is lighter in color than previous vintages, it still maintains a faint salmon color. Aromas of white strawberry, candied cherries, and a smoky minerality fill the glass. Light on the palate and fun to drink, flavors of fresh spring strawberries and raspberries flow over the tongue. Tangy acidity and a refreshing finish beg for the warm days of summer. Serve chilled and drink now or over the next eight months. This wine may develop a sediment that does not influence the quality of the wine and is a result of our small lot production. The Alder Springs Vineyard is located 12 miles west of the Pacific Ocean, overlooking the town of Laytonville in the center of Mendocino County. The fruit for the Spell wines comes from three distinct blocks located at an elevation between 1700 to 1900 feet on a Southeastern facing slope. 3 Tiers, which makes up the majority of the blend, is planted to Dijon clone 459 and heritage clones of DRC and Calera. The Upper West Vineyard is planted to Dijon clones 667 and 777 and the Upper Vineyard is planted to Dijon clones 115, 667, and 777. The low-vigor, volcanic-based soils produce wines of distinctive old world character. The 2013 Alder Springs Vineyard Pinot Noir is vivid violet in color, aromas of blueberry, ripe raspberry, dried rose pedals, clay, smoke, peat, and ground coffee drift from the bowl. Youthful red fruit flavors, juniper berry, espresso and a mineral element are seamlessly balanced with powdery-dry tannins and lively acidity. 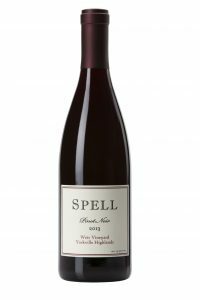 Like its brother, the Weir Vineyard pinot noir, this wine has the potential to age gracefully for those with the space and time to cellar a few bottles over the next decade. Oak: 100% French oak; 43% new oak, 14% once used and 43% older. The suggestive 2013 Weir Vineyard Pinot Noir is introduced by red, ruby color. Aromas of red fruit and bramble mix with aromas of violets, crushed dried herbs, leather, and tobacco leaf. Flavors of raspberry, cherry, and cranberry dance with savory notes of smoked meat, sweet pipe tobacco, and black tea. The full expression of this youthful and complex wine seems to hide behind the structure present at this point. Designed to age, but enjoyable now, those who are patient will reap the greatest reward. Drink now or over the next decade. The Umino Vineyard is owned and farmed by Dave Umino, a fifth generation Japanese American from a Central Valley farming family. After a career as a forensic metallurgist the vineyards replaced an old apple orchard in 1995. Planted to Pinot Noir Dijon clones 777, 667, 115 and 459 it is located southwest of Sebastopol at the top of Blucher Valley in what is unofficially referred to as the Sebastopol Hills of the Russian River Valley AVA. Cold maritime air funnels through the hills to moderate ripening of the fruit which produces wines of exceptional depth, concentration and character. The 2013 Umino Vineyard Pinot Noir is deep purple in color, and a bowl full of cherries and cream leaps from the bowl. Black cherry, blackberry and raspberry flavors mix with hints of mushroom, coffee, and sweet toasted oak on the palate. Bright acidity and velvety smooth tannins mingle with flavors of bing cherry and ripe strawberry on a mineral laced finish. Drink now or over the next 5 to 7 years. The Terra de Promissio Vineyard is owned and managed by Charles and Diana Karren with the help of Diana’s parents it is a true family operation. Planted in 2002 to Pinot Noir clones 777 and 115 it is located east of Petaluma on a rolling hill in what is unofficially referred to as the Petaluma Gap of the Sonoma Coast AVA. Buffeted by cold maritime winds the fruit ripens slowly and produces wines of exceptional elegance and purity. The Spell Terra de Promissio Vineyard Pinot Noir is dark violet in color and has aromas of cherry, strawberry, oats, all spice, anise, sassafras add to a brooding quality in the glass. Flavors of cranberry and pomegranate hinting towards darker fruit and forest duff sweep across the palate. Balanced by smooth tannins and perfect acidity flavors of black cherry and bitter chocolate seem to linger for eternity. Drink now or over the next 5 to 7 years. 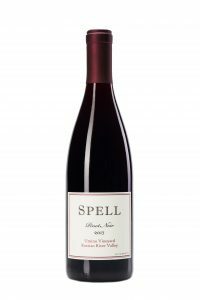 Dark violet in color, aromas of blueberry, ripe raspberry, dried rose pedals, clay, smoke, peat, and ground sage spring from the glass. Youthful red fruit flavors, juniper berry, espresso and a mineral element are seamlessly balanced with powdery-dry tannins and lively acidity. Enjoyable now, this wine shows potential for age-ability and should reward those with the space and time to cellar a few bottles over the next decade. Oak: 100% French oak; 40% new oak, 25% once used and 35% older. 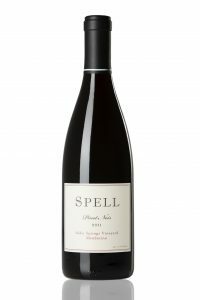 The Spell Marimar Estate Vineyard Pinot Noir is sourced from the Dona Margarita Vineyard overlooking the township of Freestone on the Sonoma Coast is the postcard perfect Pinot Noir vineyard. With its close proximity to the cold Pacific Ocean on a hillside of Goldridge soils the wines produced from this vineyard are exotic and seamlessly balanced. The Spell Marimar Estate Vineyard Pinot Noir has a dark crimson, almost purple color introduces bright aromas of Black cherry, ripe strawberry, sassafras, forest floor and black chanterelles that fill the glass. Smooth, lush tannins circulate with ripe fruit flavors while Sumac spice and coffee notes carry through to the finish highlighted by a lingering mineral element. Drink now or over the next 4 or 5 years. Oak: 100% French; 40% New, 25% once used, and 35% older. 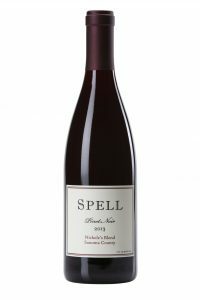 The fruit for the 2013 Nichole’s Blend Pinot Noir comes from the DeVoto, Terra de Promissio, Umino and Alder Springs Vineyards. From as far south as the Petaluma Gap, where the cold maritime breezes help to produce wines of excellent purity and elegance; to the far western edge of the Russian River Valley, which produces wines with richness and ripe dark fruit flavors. The resulting wine is an excellent example of the harmony between these distinctive regions within Sonoma County. 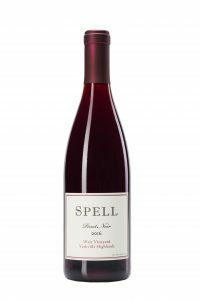 Bright ruby in color, aromas of citrus pith, ripe raspberry, black cherry, toasted oats, sandalwood and crushed dried herbs mingle in the glass. Sappy fruit flavors with lively acidity and a hint of minerality coalesce in a sultry finish. This youthful, energetic wine is immensely gratifying now and should become even more so with time. Drink now, or over the next 5 to 7 years. Oak: 100% French; 30% new, 30% once used and 40% older. Produced from the Saignée (French for ”bleed”) of the Pinot Noir. The juice for this wine is removed (bled) from each lot of Pinot Noir as it is being destemmed into the fermenter. It is transferred to a stainless steel tank which is maintained at 50 degrees F to promote a slow, cool fermentation that preserves the fantastic aromatics. Once the primary fermentation has completed (2-4 weeks after the last lot of Pinot Noir is processed) the wine is moved to a selection of neutral French oak and stainless steel barrels for another 4 to 8 weeks of aging before bottling in January. 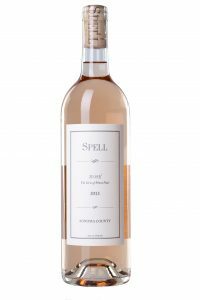 The Spell Rosé is slight salmon color, this wine yearns for warmer weather. Aromas of white strawberry, watermelon rind, and grilled white peaches fill the glass. Light on the palate, flavors of fresh spring strawberries and watermelon flow over the tongue. Bright acidity and a touch of minerality adds to a smooth, lingering finish. Serve chilled and drink now or over the next eight months. The Marimar Estate Vineyard lies on a hillside overlooking the township of Freestone on the western edge of the Sonoma Coast appellation. This special vineyard benefits from Goldridge soils and a cool marine influence, naturally controlling yields to produce concentrated, exotic wines. The Spell Marimar Estate Vineyard Pinot Noir 2011’s dark ruby, almost purple color introduces this beautiful wine. Crisply focused aromas of red raspberry and wild cherry mingle with scents of forest floor, roasted grain, orange zest, cinnamon, clove and rose petals. 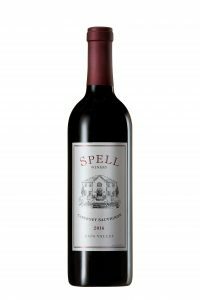 The ripe red fruit flavors paired with Garam Marsala and sumac spice notes carry through to the finish, highlighted by a lingering mineral element. Drink now or over the next 7-8 years.